MMA betting online can be a lot of fun. Especially if you are in the know and have good insight into the strengths and weaknesses of each individual MMA fighter. But if you aren’t wagering at the most reputable MMA Betting sites, then it’s all sort of pointless since it’s really a hit or miss with whether or not you will even get paid when you win. This is where we come into the picture. 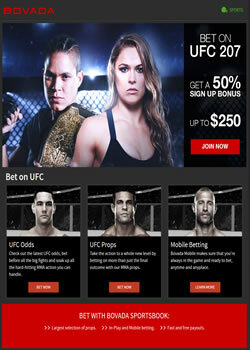 We offer in depth reviews on the most trusted MMA betting sites. Each of these sportsbooks offer robust betting options for the UFC and other MMA leagues and have been individually tested and assessed by our team of specialists and have been found to meet our specific requirements and high standards. They each operate outside of the United States and function under legal licenses and jurisdictions. They have been independently rated for high customer satisfaction and employ elaborate security protocols to keep your information secure. They also have advanced features for making complicated bets and special offers for new and established players. Betonline Sportsbook is legally licensed and based out of Panama City, Panama, and they accept players from everywhere in the world including the United States. As a welcome bonus, they will match 50% of your first deposit up to $2,500 as well as a 25% lifetime bonus whenever you reload your account. Among the strongest and most diverse range of options for MMA sports betting, they also offer advanced options like live, in-play betting and mobile betting. When your tastes glide away from betting on MMA, they also offer an online casino, poker, racebook, and even stock market and financial betting. Bovada Sportsbook is regulated and licensed through the Kahnawake Gaming Commission based in Canada, and they accept MMA fans from most US states. The states not accepted by Bovada include DE, MD, NY, NJ, NV. Bovada has continuously proven themselves as an industry leader by having outstanding customer support, fast payouts and advanced betting options such as live inplay. New players can claim their generous 50% welcome bonus up to $250 on their first deposit to the site. Bovada accepts all major credit cards as well as Bitcoin to make your gambling experience as convenient as possible. Sportsbetting.ag is owned and operated by the same company that owns BetOnline.ag, so they are also licensed and regulated under the same jurisdictions. They offer a 25% lifetime bonus for qualifying payments and a 75% welcome bonus up to $1,000 when you sign up and make your first deposit. The sportsbook itself has a clean and professional appearance and follows the same structure as their sister-site, BetOnline.ag. 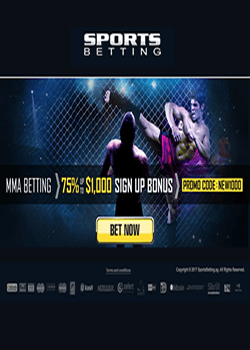 As one of the best MMA betting sites out there, they offer consistently reliable payment options for all major credit cards and financial institutions as well as online currencies such as Bitcoin.